I discovered this recipe for Chicken Parmesan Burgers on Healthy Food for Living over a year ago. Lauren’s blog was one of the first that I started following when I was just getting involved in the blogger world. 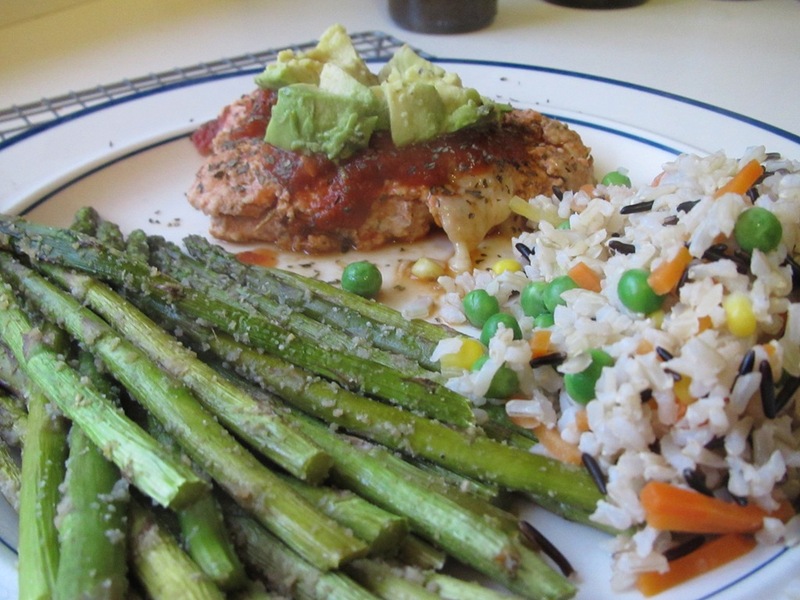 I was so impressed when this reader recipe appeared Cooking Light a few days later. I made it immediately and since then, it has been one of the BOY and my favorite quick and satisfying dinners. It only takes a few ingredients and less than 30 minutes to create these flavorful burgers. Since the BOY planned to spend the day in the library, I told him that I would be in charge of dinner. We haven’t had these burgers in a little while (because we’ve been eating everything off the grill), so they were my first choice to make for dinner. We opened up one of our wine club whites to pair with tonight’s dinner. And in honor of our trip to Door Country next month, I pulled out my favorite DC wine glasses. They BOY had the full Chicken Parm sandwich on a fresh ciabatta roll from Whole Foods. Dripping with sauce and oozing with cheese, this burger really is the best! I decided to top my burger with fresh avocado, which was a fantastic idea, if I do say so myself! 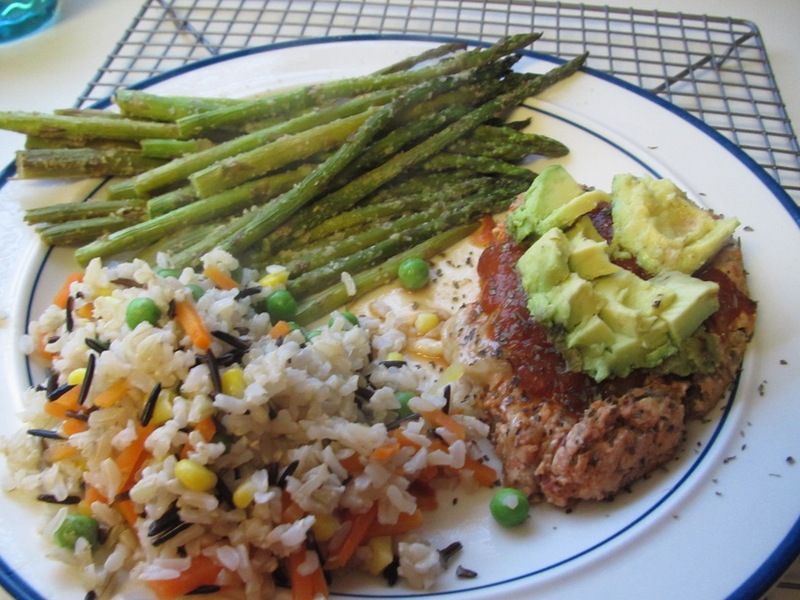 Along with a side of lemon garlic asparagus and brown rice, I was thrilled to sit down and dig into my dinner. And my glass of wine. Although after this afternoon’s BRICK, my legs are a bit sore every time I get up to refill my glass. But at least I know that I earned every sip : ) Along with the dark chocolate square I had for dessert. Now it’s time to sit back and finally work my way through the 10 episodes of Girls that I have saved on DVR. Looking for more healthy Italian? Here is my all time favorite quick and healthy Chicken Parmesan recipe! Lay two pieces of plastic wrap (about 6 inches x 6 inches) on the counter. 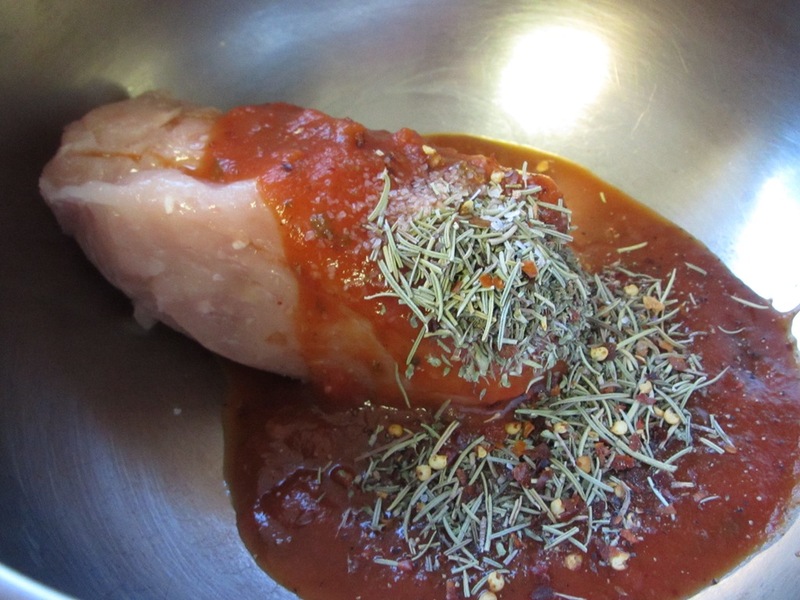 In a medium bowl, combine the ground chicken, 1/3 cup marinara sauce, and seasonings. Gently stir with a rubber spatula just until combined. Using the rubber spatula, divide the mixture evenly between the two pieces of plastic wrap. Fold the excess plastic wrap around each patty, gently forming the patties into squares to fit the rolls. Chill in the refrigerator for an hour or so. Remove the chicken patties and let sit at room temperature for about 5-10 minutes before cooking. Heat a cooking spray-coated non-stick skillet over medium/medium-high heat. Unwrap the burger patties and carefully drop them into the hot skillet. Cook the burgers for 5 minutes, flip, and cook for another 4 minutes (you may need to add a few more sprays of cooking oil before the flip). Top burgers with mozzarella cheese, tent with aluminum foil, remove from heat, and let sit for 1-2 minutes. While the burgers are cooking, cut the ciabatta rolls in half. Spray each half with cooking spray, then sprinkle with garlic powder. Toast for 2-3 minutes, or until crisp and golden. Spoon 1 Tbsp of the remaining marinara sauce onto one half of each roll. When the burgers are fully cooked (juices run clear when gently pressed) and the cheese has melted, sandwich the burgers between the garlic bread roll halves and serve. Note: I typically buy the ground chicken at Whole Foods where they have all white meat ground chicken that you can buy in smaller increments. Those burgers sound awesome. I’m going to try them since we all eat on different schedules (it’s like when the kids were in high school and had activities! I did make the date nut energy bars and all I can say is that they have become my new favorite desert-they are so good! I made mine in a corning ware dish that was about 6 1/2 X 6 1/2 and the bars came out a really nice size. Where do you get the natural coconut for the quinoa balls? I want to try them next. Congrats on getting off the couch-I am the same way- if I don’t get the workout in first thing it doesn’t always happen especially on Sat (when I have to be at work at 6-I come home and want to go to sleep or sit and veg in front of the tube). These burgers are perfect to pull together quickly. I’m so happy that you have been enjoying the bars. I shared with with a few coworkers who loved them and requested them for my next treat day. I just made a double batch this weekend to bring into the office using the natural coconut, which i pick up in the baking aisle at Whole Foods. If you can’t find it, let me know, and I can bring some your way! We just made this for dinner this past week- I found the recipe in Cooking Light magazine and it is a staple at our house! It is so good! That is so funny that we found the same recipe. I love Cooking Light!